I'm feeling pretty under the weather today. Thanks for your concern, really, but I'm just a teensy bit miserable, not a whole lot. It's either allergies, a cold, or some random virus. I've heard it said that misery loves company, though, so I'm self-diagnosing through film and television. Even if I can't figure out what's wrong, I can feel better knowing these gentlemen had it worse. If you, too, need a little healing by schadenfreude, then join me for some soup and a laugh at the misfortunes of others. Poor Professor Jackson. No one believes his theories about the real significance of Egyptian language and architecture, he gets stuck on the other side on his first trip through a Stargate, and his allergies are not being cooperative. 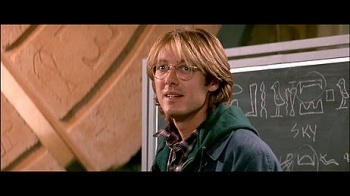 While this particular character foible was eventually written out of the subsequent Stargate television series, James Spader approached the role in the 1994 film Stargate with a hankie firmly in hand. The various sniffles enhance his portrayal of the character, adding a visceral touch that enhances the charming dorkiness of the character. Jackson's allergies don't seem severe, but as they seem to be exacerbated by Stargate travel, they can't be particularly welcome. Not sure I'm experiencing allergies, though. Not enough sneezing. While Batman: The Animated Series is one of my favorite television shows, I can't quite get behind Mr. Freeze as genuinely threatening. The sympathy I have for his personal tragedy, coupled with the relative silliness of his appearance and weaponry, make him seem not particularly frightening to me. Then again, I've never has the misfortune of being trapped in solid ice like poor Ferris Boyle. In the B:TAS episode "Heart of Ice," the CEO of GothCorp is the subject of a personal vendetta waged by Victor Fries. The final confrontation finds Boyle frozen up to his ribcage, and while I can imagine that's better than being trapped all the way, it's enough to give you the sniffles at least. The crowning glory of the encounter is Batman breaking loose of his own icy bonds and smashing Mr. Freeze in the dome with a thermos of chicken soup. As Alfred advises, it's the only way to fight a cold. I've already taken this advice, to little effect, but in the episode itself it's delicious. Overstated, it would have been egregiously campy. As it is, it's just a punny little joke in one of the most sophisticated, understated cartoons ever. What to do when you aren't cleared by Starfleet to board your ship of choice? Get a doctor buddy to shoot you full of a vaccine, and hope that you don't have an adverse reaction. When Vulcan sends out a distress signal in 2009's Star Trek, the fleet is too far out to intercept it in time. This leaves the cadets to take up the call. Spock, Uhura, and McCoy are all good to go, but that little scamp James Tiberius Kirk isn't cleared for boarding. Bones injects his pal with a vaccine to make him appear ill, then proceeds to use Starfleet's own rules against it, citing "medical code states the treatment and transport of a patient is to be determined at the discretion of his attending physician. Which is me!" Bones did neglect to check Kirk's medical records, which presumably read that Kirk is allergic to whatever vaccine he got. The result of this potentially dangerous slip amounts to nothing more than profuse sweating, a swollen tongue, and two very puffy hands, making it "okay" to laugh at Kirk's distress. This entire movie had me worried, but I enjoyed it much more than anticipated, and comedic moments such as this were a key factor in my appreciation. Haven't been injected that I know of, so it's safe to say I'm not experiencing a similar reaction. Star Trek: The Next Generation's Season Two finale "Shades of Gray" is undoubtedly one of the most laughable frames ever built for a clip show, and in this assessment I'm counting "Another Simpsons Clip Show." Riker has contracted a "very mysterious" microorganism via thorn prick, as one does, and it's going to fry his brain within a matter of hours. Dr. Pulaski realizes that the only thing to do is to stimulate the neurons in Riker's brain, so the neurons stay resistant to the virus attacking his nervous system. "Stimulating neurons" roughly translates to "let Riker remember stuff we've already filmed and aired in previous episodes." Not only is our charismatic Number One fighting for his life, but we have to endure one of the dumbest set-ups in Trek history. It's difficult to tell who has it worse, but it sure makes me feel better by comparison. Well, that's done me very little good, but at least I got a laugh. Best medicine, right? Additionally, if you find yourself in need of a laugh today, or you just happen to enjoy inventories such as this, make sure to check out The Escapist's newest addition to our video series lineup, Top 5 With Lisa Foiles. She'll be bringing you weekly lists of what's what in videogames, and she seriously knows her stuff. Go ahead and check it out, I needed to go find more tissues anyway.